For people who live on or near an active fault line – such as the San Andreas Fault in California, the Median Tectonic Line in Japan, or the Sunda Megathrust of southeast Asia – earthquakes are a regular part of life. Oftentimes, they can take the form of minor tremors that come and go without causing much damage. But at other times, they are cataclysmic, causing widespread destruction and death tolls in the thousands or more. But what exactly is an earthquake? What geological forces lead to this destructive force? Where do they typically happen, and how many different types are there? And most importantly, how can we be better prepared for them? An earthquake is defined as a perceptible tremor in the surface of the Earth, which is caused by seismic waves resulting from the sudden release of energy in the Earth’s crust. Sometimes, they are detected because of the transfer of this energy to structures, causing noticeable shaking and noise. At other times, they can be violent enough to throw people and level entire cities. Generally, the term is used to describe any seismic event that generates seismic waves. An earthquake’s point of initial rupture is called its focus or hypocenter, while the point on the Earth directly above it (i.e. the most immediately-effected area) is called the epicenter. The structure of the Earth’s crust, which is divided into several “tectonic plates”, is responsible for most earthquakes. These plates are constantly in motion due to convection in the Earth’s semi-viscous upper mantle. Over time, these plates will separate and crash into each other, creating visible boundaries called faults. When plates collide, they remain locked until enough pressure builds that one of them is forced under the other (a process known as subduction). This process occurs over the course of millions of years, and occasionally results in a serious release of energy, frictional heating and cracking along the fault lines (aka. an earthquake). The energy waves that result are divided into two categories – surface waves and body waves. Surface waves are so-named because they are the energy that reaches the surface of the Earth, while body waves refer to the energy that remains within the planet’s interior. It is estimated that only 10% or less of an earthquake’s total energy is radiated as seismic energy, while the rest is used to power the fracture growth or is converted into friction heat. However, what reaches the surface triggers all of the effects that we humans associate with earthquakes – i.e. tremors that vary in duration and intensity. 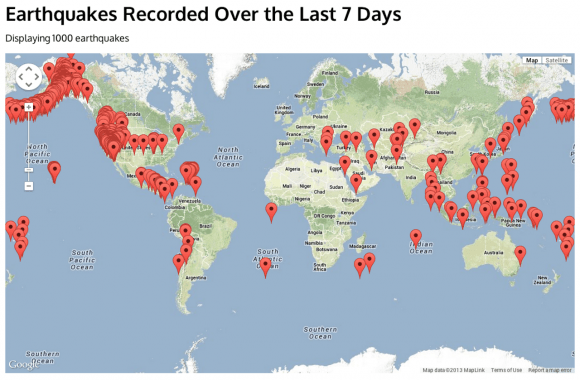 Occasionally, earthquakes can happen away from fault lines. These are due to some plate boundaries being located in regions of continental lithosphere, where deformation is spread out over a much larger area than the plate boundary. Under these conditions, earthquakes are related to strains developed within the broader zone of deformation. Earthquakes within a plate (called “intraplate earthquakes”) can also happen as a result of internal stress fields, which are caused by interaction with neighboring plates, as well as sedimentary loading or unloading. Aside from naturally occurring earthquakes (aka. 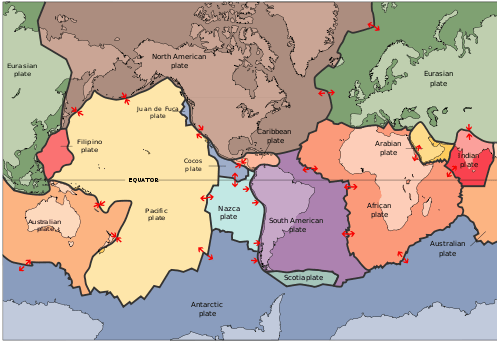 tectonic earthquakes) that occur along tectonic plate lines (fault lines), there are also those that fall under the heading of “human-made earthquakes”. These are all the result of human activity, which is most often the result of nuclear testing. This type of earthquake can been felt all from considerable distance after the detonation of a nuclear weapon. There is very little actual data that is readily available on this type of earthquake, but, compared to tectonic activity, it can be easily predicted and controlled. Scientists measure earthquakes using seismometers, which measures sound waves through the Earth’s crust. There is also a method of measuring the intensity of an earthquake. It is known as the Richter Scale, which grades earthquakes from 1 to 10 based on their intensity. Although there is no upper limit to the scale, most people set ten as the upper limit because no earthquakes equal to or greater than ten have been recorded. Scientist hypothesize that level 10 earthquakes were probably more common in prehistoric times, especially as the result of meteor impacts. Earthquakes can happen on land or at sea, and can therefore trigger other natural disasters. In the case of those that take place on land, displacement of the ground is often the result, which can cause landslides or even volcanoes. When they take place at sea, the displacement of the seabed often results, causing a tsunami. Even though major earthquakes do not happen that often, they can cause substantial damage. In addition to the aforementioned natural disasters they can cause, earthquakes can also trigger fires when gas or electrical lines are damaged and floods when dams are destroyed. Some of the most devastating earthquakes in history include the 1556 Shaanxi earthquake, which occurred on January 1556 in China. This quake resulted in widespread destruction of housing in the region – most of the housing being dwellings carved directly out of the silt stone mountain – and led to over 830,000 deaths. The 1976 Tangshan earthquake, which took place in north-eastern China, was the deadliest of the 20th century, leading to he deaths of between 240,000 and 655,000 people. The 1960 Chilean earthquake is the largest earthquake that has been measured on a seismograph, reaching 9.5 magnitude on May 22nd, 1960. And then there was the 2004 Indian Ocean earthquake, a seismic event that also triggered a massive tsunami that caused devastation throughout southeast Asia. This quake reached 9.1 – 9.3 on the Richter Scale, struck coastal communities with waves measuring up to 30 meters (100 ft) high, and caused the deaths of 230,000 people in 14 countries. More than 3 million earthquakes occur each year, which works out to about 8,000 earthquakes each day. Most of these occur in specific regions, mainly because they usually happen along the borders of tectonic plates. Despite being difficult to predict (except where human agency is the cause) some early warning methods have been devised. For instance, using seismological data obtained in well-understood fault regions, earthquakes can be reasonably predicted weeks or months in advance. Regional notifications are also used whenever earthquakes are in progress, but before the shocks have struck, allowing people time to seek shelter in time. Much like volcanoes, tornadoes, and debris flows, earthquakes are a force of nature that is not to be taken lightly. While they are a regular feature of our planet’s geological activity, they have had a considerable impact on human societies. And just like the eruption that buried Pompeii or the Great Flood, they are remembered long after they strike! For more information, you should check out earthquakes and how earthquakes work. BGS – What is an Earthquake? Waste Water Injections, associated with “FRACKING” should be a concern. Previous PostPrevious What Are Cosmic Voids?